Actress Jodie Whittaker will be the new Doctor Who, BBC America and BBC announced on Sunday. She will be the Thirteenth Time Lord and take over from Peter Capaldi who leaves the global hit show at Christmas. Jodie Whittaker says: "I'm beyond excited to begin this epic journey - with Chris and with every Whovian on this planet. It's more than an honor to play the Doctor. It means remembering everyone I used to be, while stepping forward to embrace everything the Doctor stands for: hope. I can't wait." Chris Chibnall, New Head Writer and Executive Producer says: "After months of lists, conversations, auditions, recalls, and a lot of secret-keeping, we're excited to welcome Jodie Whittaker as the Thirteenth Doctor. 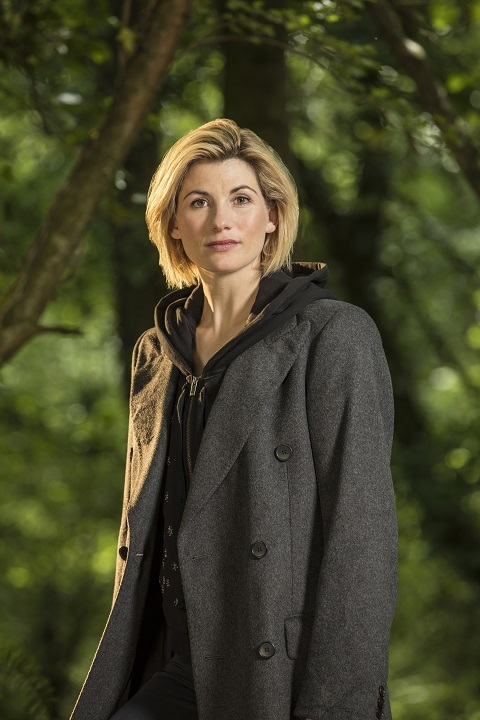 I always knew I wanted the Thirteenth Doctor to be a woman and we're thrilled to have secured our number one choice. Her audition for The Doctor simply blew us all away. Jodie is an in-demand, funny, inspiring, super-smart force of nature and will bring loads of wit, strength and warmth to the role. The Thirteenth Doctor is on her way." Sarah Barnett, President of BBC America says: "The fact that there was so much interest in, quite literally, 'Who?' speaks volumes about the enduring power of the Doctor Who franchise around the world and for BBC America viewers. We couldn't be happier to welcome the remarkable Jodie Whittaker as a history making Thirteenth Doctor and look forward to the continuation of this story." Charlotte Moore, Director of BBC Content says: "Making history is what Doctor Who is all about and Chris Chibnall's bold new take on the next Time Lord is exactly that. The nation is going to fall in love with Jodie Whittaker - and have lots of fun too!" It's very nerve-racking, as it's been so secret! Yes. Very hard! I've told a lot of lies! I've embroiled myself in a whole world of lies which is going to come back at me when this is announced! In my home, and with my agent, it was The Clooney. Because to me and my husband, George is an iconic guy. And we thought: what's a really famous iconic name? It was just fitting. It feels completely overwhelming, as a feminist, as a woman, as an actor, as a human, as someone who wants to continually push themselves and challenge themselves, and not be boxed in by what you're told you can and can't be. It feels incredible. I want to tell the fans not to be scared by my gender. Because this is a really exciting time, and Doctor Who represents everything that's exciting about change. The fans have lived through so many changes, and this is only a new, different one, not a fearful one. I'm most excited about becoming part of a family I didn't even know existed. I was born in 1982, it's been around longer than me, and it's a family I couldn't ever have dreamed I'd be part of. It was the most incredible chat because I asked every question under the sun, and I said I'd take a few weeks to decide whether I was going to audition. He got a phone call within 24 hours. He would've got a phone call sooner, but my husband was away and there was a time difference! No. There was no persuasion needed. If you need to be persuaded to do this part, you're not right for this part, and the part isn't right for you. I also think, for anyone taking this on, you have to want to fight for it, which I certainly had to do. I know there will have been some phenomenal actors who threw their hats in the ring. Well they can't because they haven't known until now, but I'm certainly expecting a couple of calls - I've got a couple of mates in there. I'm mates with a companion [Arthur Darvill], I'm mates with a trio of Doctors. I know Matt Smith, Chris Eccleston and obviously David Tennant. Oh! And let's throw in David Bradley! Four Doctors! So I'm hoping I get some calls of advice. Jodie Whittaker graduated from the Guildhall School of Music and Drama in 2005 with a gold medal in Acting. Since then she has worked continually in Film, Television and Theatre. Her TV credits include the critically acclaimed BBC America and ITV drama 'Broadchurch' (for which she was nominated for 'Best Actress' for the RTS Television Awards), Emmy award-winning 'Black Mirror', Sky 1's 'The Smoke', BBC's 'Cranford', in which she starred opposite Judi Dench and Imelda Staunton, 'The Night Watch'(BBC), 'The Accused'(BBC), and 'Tess of the D'Urbervilles' (BBC). Jodie has recently finished shooting 'Journeyman' written and directed by Paddy Considine as well as the lead in the new BBC drama series 'Trust Me'. Her other film credits include 'Venus', (which earned her nominations for 'Best Newcomer' at the 'British Independent Film Awards', 'Best British Newcomer' at the 'Critic's Circle Awards' and 'Best Actress in a Motion Picture' at the 'Satellite Awards'), 'Attack the Block', 'One Day', 'Black Sea', 'Good Vibrations', 'St.Trinian's', 'Get Santa' and most recently 'Adult Life Skills' which she Executive Produced as well as starred in which received a number of BIFA nominations. Jodie made her professional theatrical debut at Shakespeare's Globe Theatre in 'The Storm'. Other theatre credits include playing the title role in 'Antigone' at the Royal National Theatre, 'Bash' at the Trafalgar Studios 'Awake and Sing' and 'Enemies' at the Almeida, both directed by the then Artistic Director, Michael Attenborough.